Welcome to the Lackawanna River Heritage Trail, including the D&H Rail-Trail. The Lackawanna River Heritage Trail is a storied route that stretches more than 70 miles, passing through the heart of the Lackawanna Heritage Valley National and State Heritage Area. The Lackawanna Heritage Valley is located amid the mountains of Northeastern Pennsylvania where the waters of the Lackawanna River flow. The trail is an artery that connects more than 30 communities through Luzerne, Lackawanna, Susquehanna and Wayne County. The trail also reaches into the heart and soul of the place that is known for its friendly people, rich cultural traditions, delicious ethnic foods and magnificent natural resources. The Valley is dotted with vestiges of a great industrial past, authentic historic sites, beautiful civic, religious and residential architecture, notable educational institutions and a special sense of community. This is a place with a unique personality that sets it apart. Whether you are here for business, to visit friends and family, for recreation or rest, we welcome you with the hope that your time here will draw you back again and again. To help raise awareness for their causes, dozens of local organizations choose to host running events along the scenic Lackawanna River Heritage Trail. In 2018, the Lackawanna River Heritage Trail was the site of 25 timed races where more than 7,000 people walked, ran, and jogged more than 70,000 miles. For questions, please contact April Rogato, Executive Assistant, at (570) 963-6730, ext. 8200 or by email at ARogato@LHVA.org. The Scranton Half Marathon Pavilion is located at the entrance of the Scranton Riverwalk at the Olive Street Trailhead, in Scranton. A popular site for the start of dozens of annual charity races and walks, the newly constructed pavilion is also the setting for many educational and community events. The pavilion measures in at 38 feet by 60 feet and is rented to civic organizations and community partners looking for a spacious and well-maintained outdoor event venue. 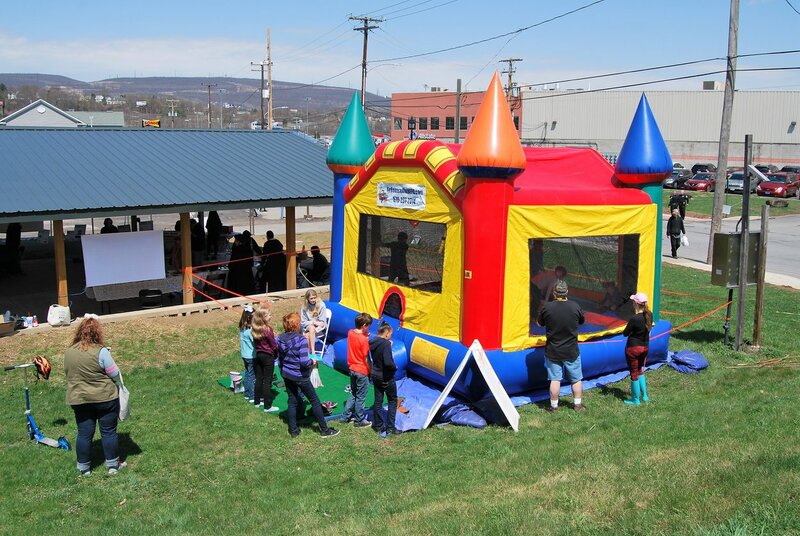 The Nay Aug Avenue Natural Play Area in Scranton opened in July of 2015. Situated on land adjacent to the levee of the Lackawanna River and the Lackawanna River Heritage Trail, the park is built with natural and recycled materials. 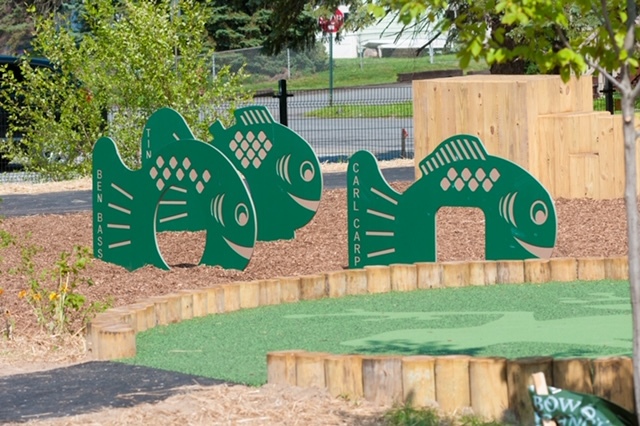 Its unique design and construction make the play area the first of its kind in Pennsylvania. The park features Turtle Hill, a turtle-shaped area formed from mounded earth, a wooden Snake Climb, and a glider that can accommodate two wheelchairs at a time. A small clubhouse, the Fidelity Fishing Shack, houses panels completed by local artists of all ages that were chosen as the winners of our “Nature Based Art Contest. A bicycle safety track, the Tike Bike Trail, encircles the play area. Safety signage, such as “Stop,” and “Curve Ahead,” line the simulated road, and a small performance space, the Lily Pad Stage, features a frog center stage. LHVA is pleased to increase recreational opportunities for people with mobility disabilities by allowing the use of other power-driven mobility devices (“OPDMDs”) in areas where they can be operated safely, without posing a risk of serious harm to natural and cultural resources. 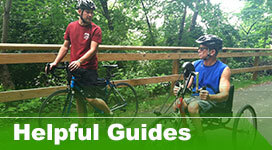 All OPDMDs operated on the Trail must meet the standards in the – OPDMD policy.